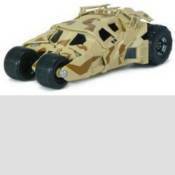 Batman Dark Knight Rises Camo Tumbler Hot Wheels Heritage: Awesome high-quality Hot Wheels vehicle from The Dark Knight Rises! The Batman Dark Knight Rises Camo Tumbler Hot Wheels Heritage vehicle boasts an incredible amount of precision detail at the 1:18 scale. No fan of Batman should go without this amazing die-cast vehicle! Ages 15 and up.